Each $88 box contains 20 packs. Each pack contains 8 cards. The ever popular Puella Magi Madoka Magica The Movie - Rebellion finally makes its debut in the English Edition of Weiss Schwarz. 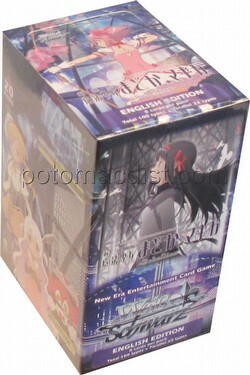 Power up your older decks, or even build new ones with the latest Weiss Schwarz booster pack. There are 6 exclusive SP Gold Foil/Hot Stamp signed cards from the Japanese voice actresses inserted randomly in packs (Madoka Kaname: Aoi Yuki, Homura Akemi: Chiwa Saito, Sayaka Miki: Eri Kitamura, Kyoko Sakura: Ai Nonaka, Mami Tomoe: Kaori Mizuhashi, Nagisa Momoe: Kana Asumi). There are 100 different cards in the set plus 22 parallels. One of 7 different promo cards is included in each booster box. Bonus Offer: You will receive a free Weiss Schwarz play mat with every 4 boxes of Puella Magi Madoka Magica The Movie - Rebellion boosters pre-ordered!